The Gatwick airport was closed over more than a day based on eyewitness reported sightings of a drone — which we take to mean a small unmanned aircraft. After much investigation (and the arrest and release of suspects) the embarrassing admission that it might all have been about nothing came just before Christmas, giving everyone a few weeks to forget about it in a haze of seasonal gluttony and bad jumpers. But the second week of January brought another story. This time it was London’s main airport, Heathrow, and yet again at dusk on a winter’s evening a drone spotting was reported. The airport was closed, and in contrast to Gatwick there were multiple reports of sightings. Surely with lights spotted over the runway there could be no doubt, we’d caught the pesky drone red-handed! We’ve left reporting on this incident for a while on purpose, because our intent here is to present an informed analysis rather than breathlessly commenting on the news. There is little point in regurgitating what can easily be read in every newspaper, so instead we should be looking at what wasn’t in the newspapers. In the coverage of those lights over Heathrow, we saw plenty of reporting of those lights in the sky, but what we didn’t see was any results of an investigation of them. We’re not aeronautical experts here at Hackaday, so we sought out some members of our community who do have expertise in this area. Asking them about the incident quickly revealed a verifiable culprit. [Andrew Hyams] is both Chair of Team MiniAirshow and co-host of the Let’s Drone Out Podcast, and using ADSB tracking data he was able to demonstrate that there had been a conventional aircraft in the air over Heathrow during the time in which the lights had been spotted. G-MPSC is a Eurocopter-Kawasaki EC-145 helicopter, and while it’s not exactly a famous aircraft, it’s a common sight around the capital as one of the Metropolitan Police helicopters. That’s right, there is a distinct possibility that a significant number of the reported drone sightings at Heathrow were of the police helicopter rather than of any drone. 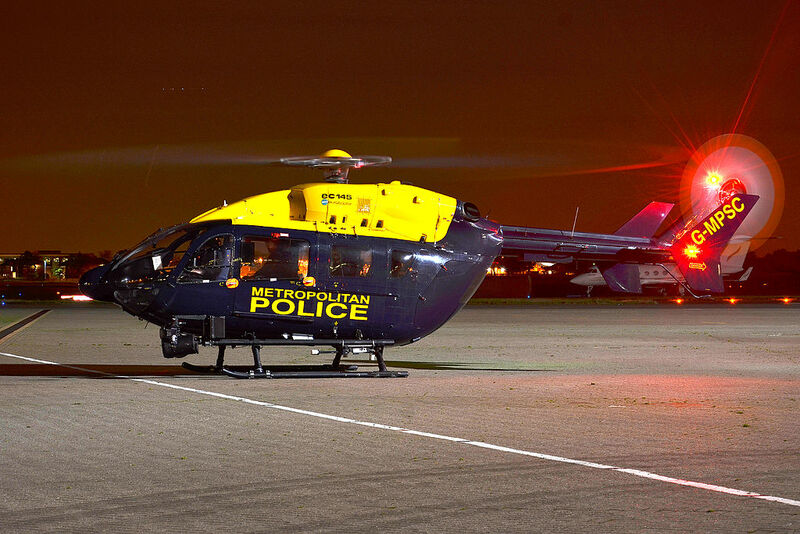 The ADSB records show that the police helicopter arrived in the Heathrow area at about 17:33 on the 8th of January and left at about 18:26, having spent a considerable time hovering over various parts of the airport environs through the time that observers on the ground claimed to have seen some lights in the sky. 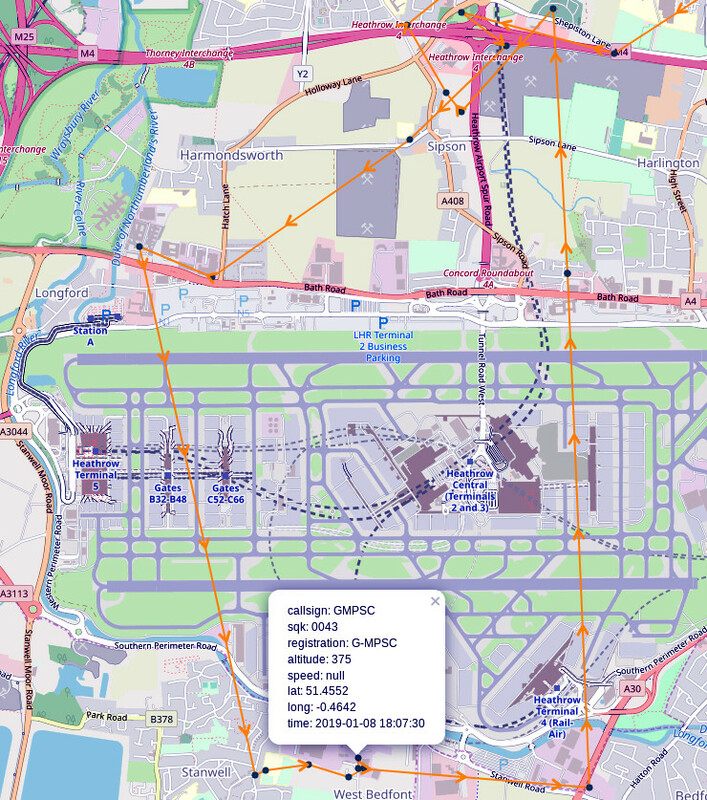 G-MPSC’s path over the Heathrow area on the 8th of January, as seen by ADS-B Exchange. So some very basic investigation on the part of a Hackaday reader with some knowledge of an ADSB tracking website was enough to confirm that the source of these sightings was likely not in fact a drone, but the Metropolitan Police helicopter. It’s quite likely that G-MPSC arrived on the scene in the wake of the initial report and was not the reason the airport was closed in the first place. Its presence as the possible cause of the spate of subsequent drone sightings amply demonstrates the complete futility of depending upon reports from uninformed observers on the ground. We don’t know what caused the initial sighting, but we do know there has been no tangible evidence produced for a drone being present. The work of a journalist has many facets, but at its heart the responsibilities are two-fold. We report the news, and we investigate it. A Hackaday example of the first might be to tell the world about the launch of a new 3D printer, while the second might be going behind a manufacturer’s denials to find the truth behind reports of fires involving a particular 3D printer model. When we are presented with something our job is to ask questions even when we know what the answers will be, because the real stories come in not taking what we are given at face value. And when something appears that is outside our personal areas of expertise, we enlist the help of experts to inform us in our writing. In this case it is abundantly clear that the journalists reporting from Heathrow followed up the bungled response at Gatwick by performing the same act a few weeks later without investigating the reliability of the source of the sightings. If a Hackaday reader can spend ten minutes with a web browser to reveal G-MPSC’s path that night then it is not unreasonable to expect that the formidable investigative resources of a global news organisation could do the same. We need to see better reporting, a readiness to investigate official accounts rather than regurgitate them, and above all a willingness to consult experts in the field rather than people from other fields with a vested interest. An airline pilot is not an expert on drones, it’s akin to saying a supertanker captain is an expert on kayaks because both vessels are boats. This feels as though we are repeating the same story over and over again, but it’s important to say once more why accurate reporting and good incident investigation is vital in drone incidents. It goes without saying that fliers breaching protected airspace and putting lives in danger should be prosecuted, in fact almost unnoticed among the two airport closure stories we have a case of exactly that happening. A man is facing criminal charges for flying a machine in a field near Heathrow on Christmas Eve, and though it’s probable he’s no terrorist but simply an idiot who decided on some recreational flight in an inappropriate place, it’s entirely appropriate for him to be brought to book. Where the problem comes is that all the other incidents are being reported unquestionably as involving drones with very little tangible evidence beyond something unidentifiable in the air seen by an uninformed member of the public. This forms the public record of drone incidents, and in turn informs the official response. As a result we are in a full-blown moral panic about drones from which will undoubtedly come bad laws. We saw that the first official response at Gatwick was to round up a local drone enthusiast they found on Facebook, so it’s not an unreasonable step to imagine that proposed new powers for police on the matter could be similarly abused. It’s a depressing prospect that we are expecting to spend time in the future reporting on harassment of responsible drone fliers, and that there is a real likelihood that members of our community could find themselves in the nick when their only crime has been to come to the attention of authorities anxious to be seen to be doing something. It feels as though we are a lone voice in the wilderness on this issue, but we don’t think it is inappropriate to ask for better reporting and investigation of drone stories. Since there is invariably no tangible evidence in reported drone incidents this is not an unreasonable thing to say: Show us the drone. 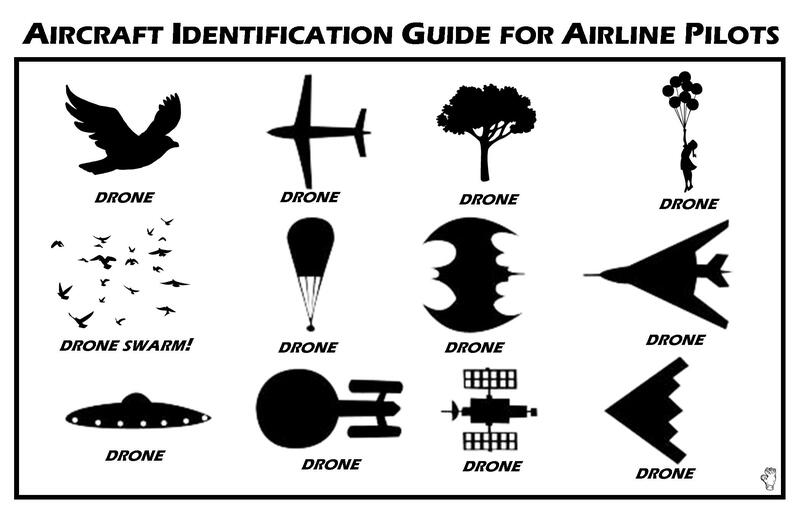 May I suggest https://hackaday.com/wp-content/uploads/2017/07/aircraft-id-guide-for-airline-pilots.jpg ? Add Mary Poppins to that list and that’s gold! The draft drone bill is so ill thought out. During some recent $politicaleventthatshallnotbementioned an amendment was sneaked out with very subtle wording changes that introduced significant restrictions (removal of the 250g excemption). Following these changes, it will be illegal to fly a paper aeroplane within 5nm of a protected aerodrome (with first obtaining ATC clearance). Like many others, I very much doubt that there ever was a UAV at Gatwick or Heathrow. I’m stopping short of suggesting that there was deliberate misreporting but there are parties that are desperate (for unfounded reasons) to introduce more draconian rules on UAV operations. As is often the case, adequate rules are already in place but they are not enforced properly. Mass hysteria by the press then guides public perception and then government is forced to act. And, again as is often the case, the published new rules do nothing to address the problem but make life difficult for those that act responsibly. I wonder how long the new rules stay in place if everybody that wanted to launch a paper aeroplane called ATC before doing so? Here in Finland we’ve had such rules for some time now. I can answer your question: “I wonder … if everybody .. called ATC?” Here’s what happens: they’ve introduced a 35 EUR free every time you contact ATC for drone flying. Unless you are a troll then shame on you. The nautical mile is usually abbreviated nmi. If the original document really says nm, then all the paper planes are safe. Too close for missiles, switching to guns? Also, forgot to say (oh for the edit button)…. That was an awesome piece, Jenny. Well done! I think you’ve uncovered an unfortunate trend in news reporting. The reporting agencies are in such a frenzy to be the first to get the report out that they cannot be wasting time verifying the validity of the report. These days, the so-called news agencies report rumors and expect the general population to do the hard work of finding the facts. And then there’s citizen journalism, aka blogs. And news is paid for by ad revenues so the more exciting the story is, the money it will bring in. So nobody cares anymore if the story is true or not. If you want to call yourselves journalists then you’re probably going to want to start separating your editorial content from your reporting and marking editorial content accordingly. I just see so much potential good that can come from this publication. But a lot of that good won’t happen without credibility. Every time the above happens, or any mistake, large or small, gets published, that credibility is damages, especially when that mistake is perceived as easily caught. tech and gaming journo’s , new plague right now. Back in the 90s I worked in the games biz. It was well known that reviews & write ups were proportional to advertising spend. I didn’t know Kawasaki made aircraft! I bet you they are plastic bags. I see them flying around here all the time. And I have seen them fly up really high. I all so live in the landing flight path of a large air port. I really cant see so many Quard choppers flying that high so much. I have 6 Quads and 1 big one and there is no way I could get them that high or close to the planes, even if I added a second battery. I bet it was a seagull soaring. They maintain a relatively rigid shape for a long period of time, and from a certain angle with their body below the plane of their wings they can look a little quad-copter shaped. Actually, everyone knows the UK was accurately described via Monty Python, Benny Hill, Fawlty Towers and The Young Ones. But the “IT Crowd” was a documentary. Hopefully more “Yes, Minister” and less “House of Cards”. Man 2: “Don’t worry bro, I got your back.” He picks up his phone and calls the airport. Best we can do is keep writing and calling when laws start to be debated. Stay informed. Spread the news as it comes. Too late, indeed. We live now in the lands of George Orwell. Whatever is not regulated is forbidden. Just wait until many folks start to hack AI seriously. Have a nice day, unless it’s forbidden. While the island people have airport drone difficulties, here in the main land of fake news, last week over 1000 were laid off by the main stream media. My unverified guess is over 1000 of the highest paid were cut. The cause was loss of income due readers moving to to internet or moving away from fake news. So cutting the best & best paid seems to be the logic. As drone laws get more draconian, I predict a new trend in drone technology: stealth. Radar absorbent materials, low cross-sections, acoustic damping fan ducts, UWB communications links, extended communications ranges and improved autopilot for past-the-horizon operations, etc. This. I expect to hear soon about pickups with toppers used as getaway vehicles for clandestine drone operations. After riling up the local constables, the drone operator turns its lights off, flies it around the corner into the back of a waiting pickup, powers it down, and discretely drives away. Meanwhile, the response force is watching the sky and scanning open fields for hackers in hoodies..
Oddly enough, some of the most skeptical reporting I’ve seen on the issue other than Hackaday has been from The Register, which often loses me with its slang and odd grammar, but has been pretty clearly rolling its editorial eyes at the whole drone mess. It isn’t that RC Copters (Multi-Rotors) are the problem so much as non-enthusiasts fear and ignorance of them is very damaging. Quad-copters (Qwads) are often referred to as “Drones”, which is 100% false. The real “Drones” are the unmanned combat / surveillance aerial vehicles. (UAV’s) Which are capable of flying independently of pilot over long distances, while taking photos and / or killing people. Granted there’s commercial hardware out there that can fly independently via GPS (DJI) but most often enthusiasts opt to build their own due to cost / bragging rights. That being said, the typical hobbyist Qwad averages 4-8 minutes of acrobatic flight and immediately goes into fail-safe mode (disabling power) the moment contact is lost with the Pilot’s transmitter. Hence from that perspective, it would be very unlikely that a true Hobbyist would risk their investment, much less have the range needed to “Buzz” an Airport. However, odds are very high that some well healed dumb-arse with a DJI drone is causing mischief or that this is a government sanctioned action used to create a threat. IMHO, The true end-game here, is that Corporations and Governments will always use peoples ignorance and fear to intact unjust laws. Consider for a moment that firms such as Amazon want to enter this field for the purposes of Drone-Delivered parcels. The money behind this venture is absolutely staggering yet RC Hobbyist’s such as myself are considered a threat to their total control of the Airspace.